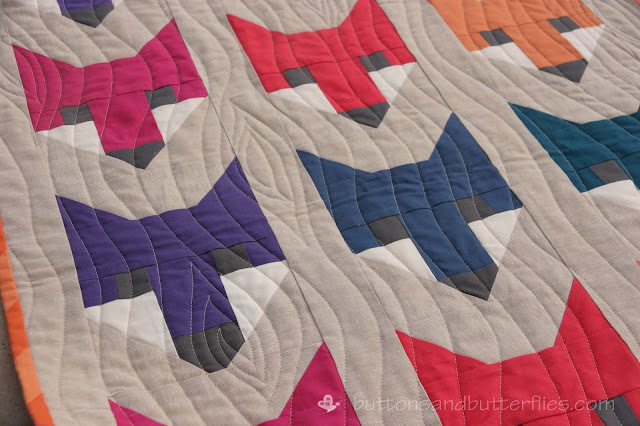 This quilt is everything to Button right now. It all started with a trip to Target for some school supplies in August. He spotted this coin purse he HAD to have! When we got home, he asked me if it was possible to make a Fox quilt. 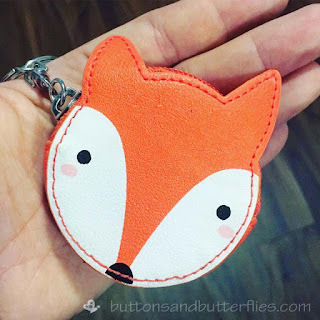 I instantly thought of Elizabeth Hartman's Fancy Fox pattern and knew he would love it. 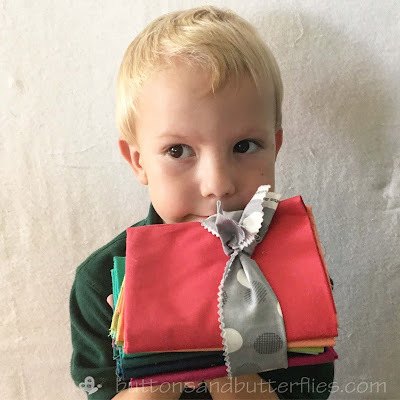 As soon as I showed it to him, he went shopping on my pre-cut shelves and pulled out this Fat Quarter Bundle with Moda Bella solids I had bought at Quiltcon 2015. He then proceeded to follow me around with it. Even if he was at school, I would find the bundle sitting in strategic places where I would find it. He was getting kinda creepy...so I bought the pattern. When I finally showed him the pattern instructions? He started to camp out in my studio to make sure I was working on it. I was even scolded for texting. I worked quickly and had almost all the blocks done. But then he wasn't happy it wasn't a "rainbow". I would make more blocks. Then we would go a few weeks without addressing it because he couldn't decide on more colors or less colors or the layout. He once told me that he "wasn't in the mood right now" like a fickle artist. 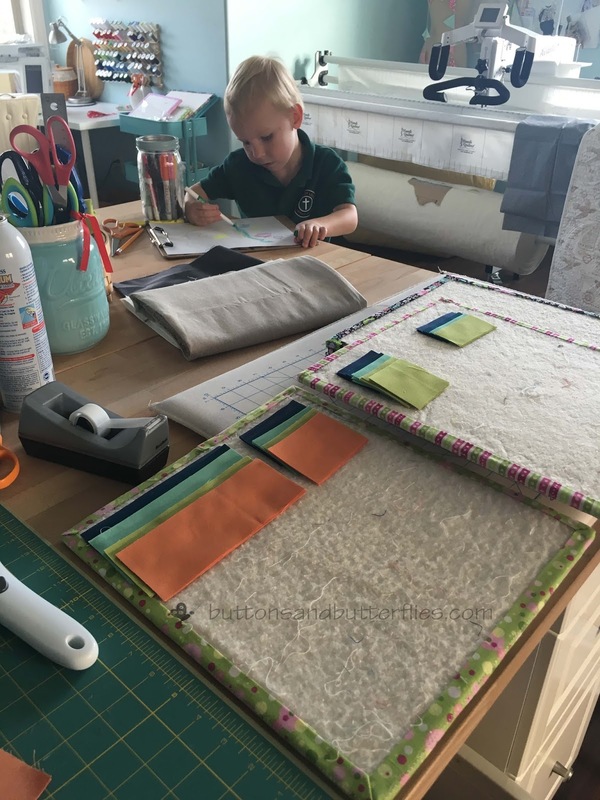 When we both finally agreed on the final layout, I got to work piecing it all together. 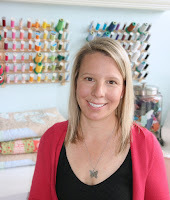 And then I ran out of the Essex Linen Background. 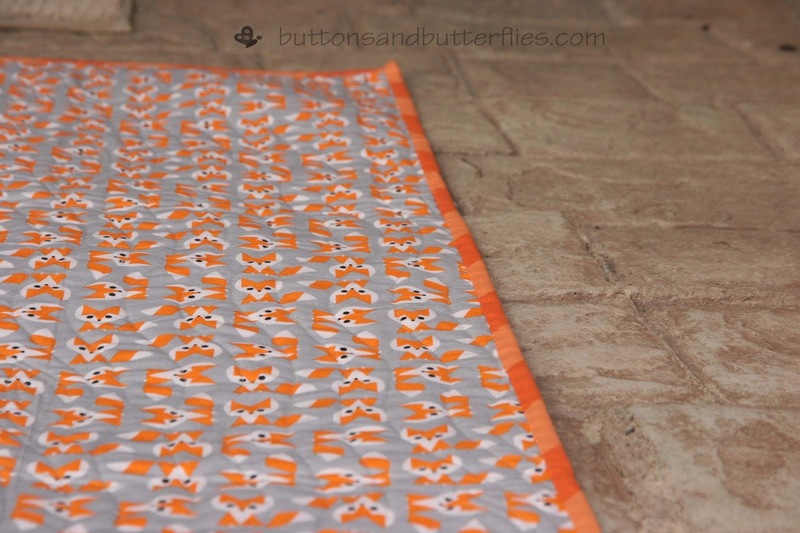 I just needed the bottom 2.5" border strip. We were also at a standstill because he couldn't decide on a backing. 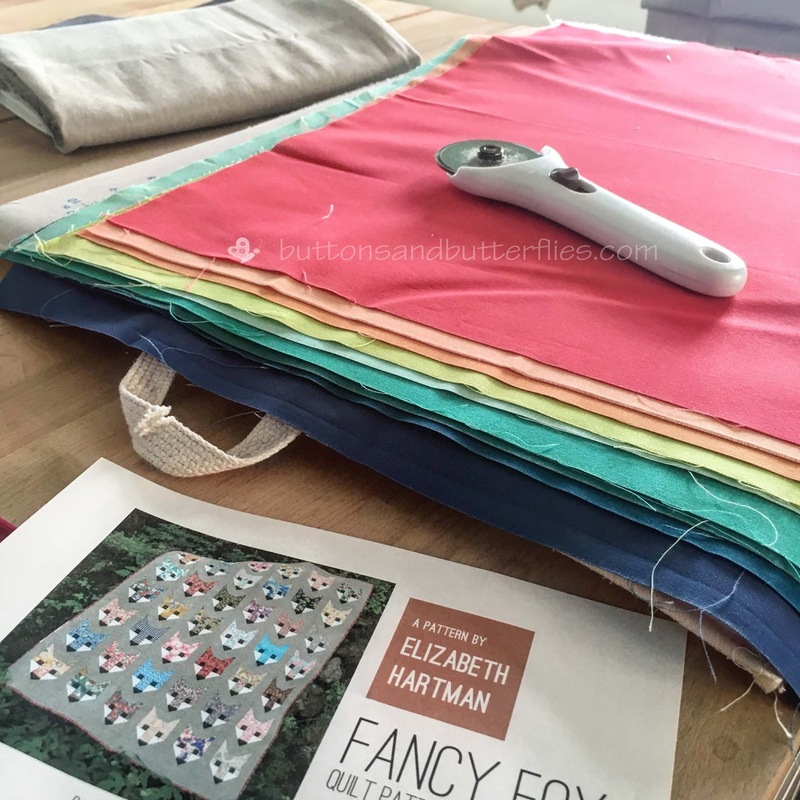 After spotting a backing fabric on Amazon suggestions while I was ordering a client's fabric selection, I made up my mind quickly to get more fabric and choose the binding for him. He liked the wood grain free motion I had done on a clients Hazel Hedgehog quilt. 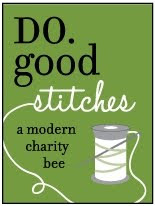 The chevron binding ended up looking like a really interesting diagonal stripe. The Riley Blake orange played really nicely with the Cloud 9 foxes. Button was so thrilled about the finish, that he was in charge of his photo shoot. His assistant: Holding some of the weight of the camera for him. He decided who, what, where he was taking photos of his quilt. Photo cred to my oldest son since I was working hard as an assistant. 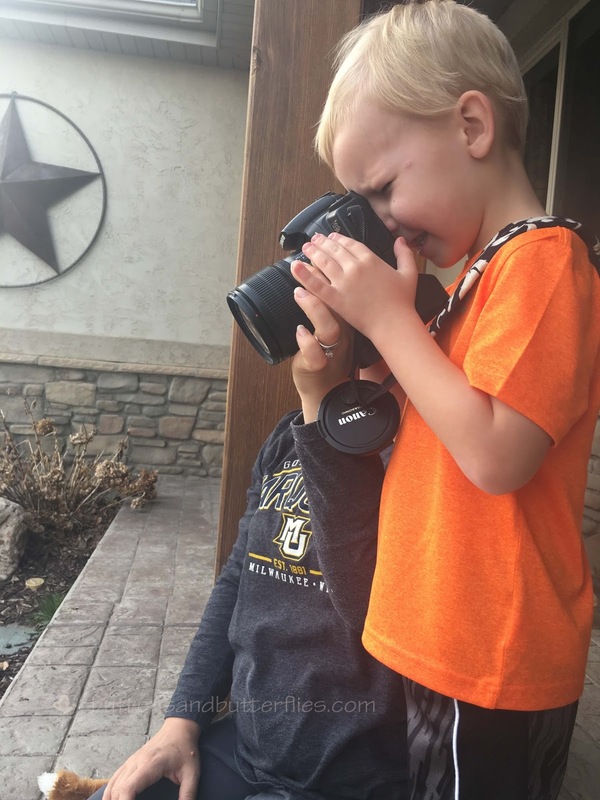 He even had to give some lens time to his pal, Fox. It has probably been the most exasperating and, yet, wonderful quilt journey I've been on recently since he was so enthusiastically involved. I can't wait to see what journeys his fox friends and quilt will be going on with him in the future! it's been fun to follow along in the process of this quilt coming to completion, and what a delight to see your son's joy and satisfaction with "his" project! 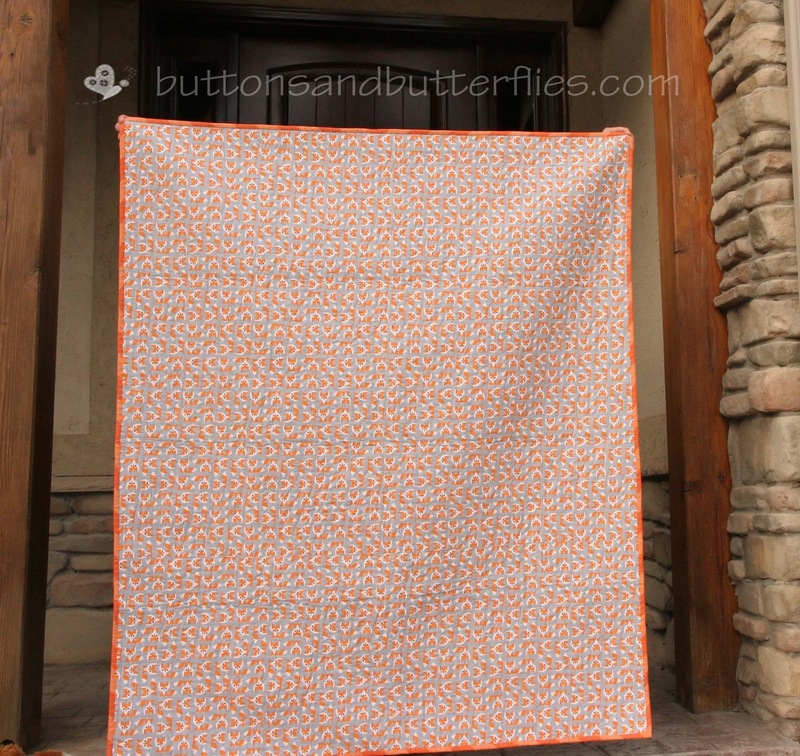 It really is a delightful quilt, and I hope you'll occasionally post pictures of it in use. This one is going to be well-loved, for sure! This is, by far, my most favorite post! The man KNOWS WHAT HE WANTS (sometimes). ❤️❤️❤️❤️❤️ I love every bit of this post! 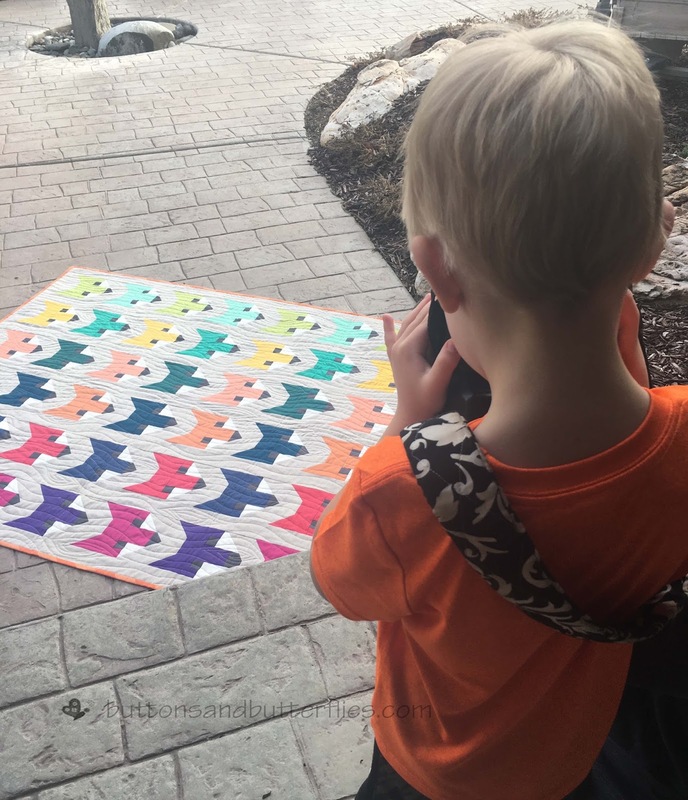 I loved him harassing you (and I MIGHT have enjoyed harrassing you on his behalf too) so glad he finally has his quilt done and you can breathe a little easier... what is his next project?????? I love that you have a tiny quilt master, and I love love his quilt - it's utterly gorgeous and wonderful, and the backing and binding are just perfect!! 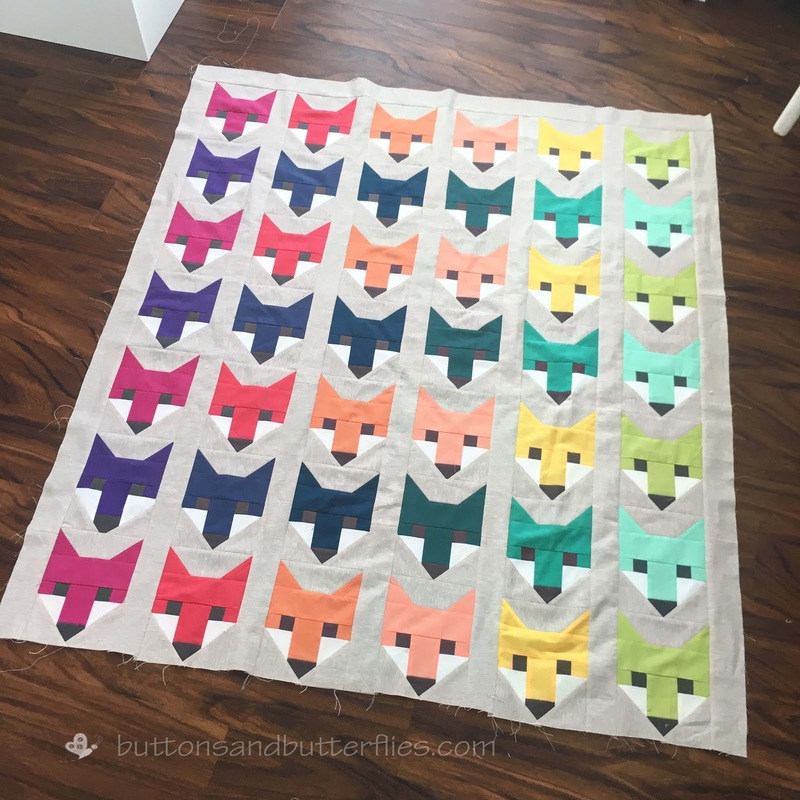 Great fox quilt. So good to find just what the kids want and will love. I loved this story. 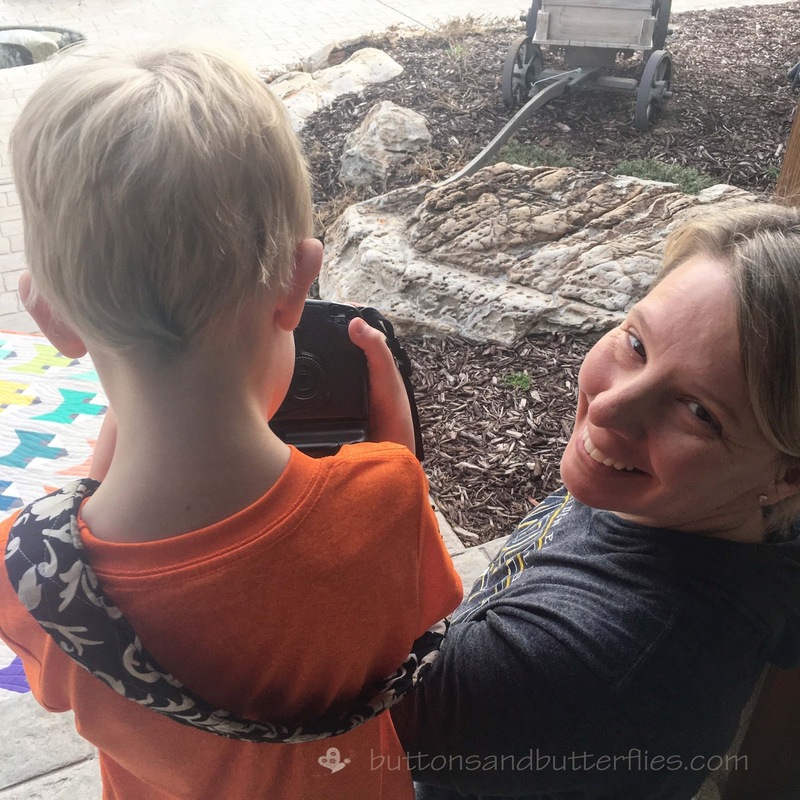 Your son reminds me of my now 27 year old daughter. She was quite opinionated and remains so! My daughter's thing was cats. She had a well loved pink stuffed animal that went with her everywhere. It even ended up going to college and her study abroad year at Oxford. 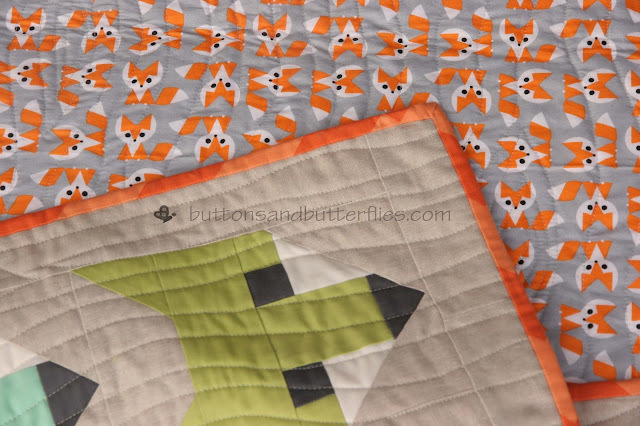 I just love Button's fox quilt. I've always wondered what a binding would look like with chevron fabrics. Nicely done! That's a lovely family story - thanks so much for sharing. 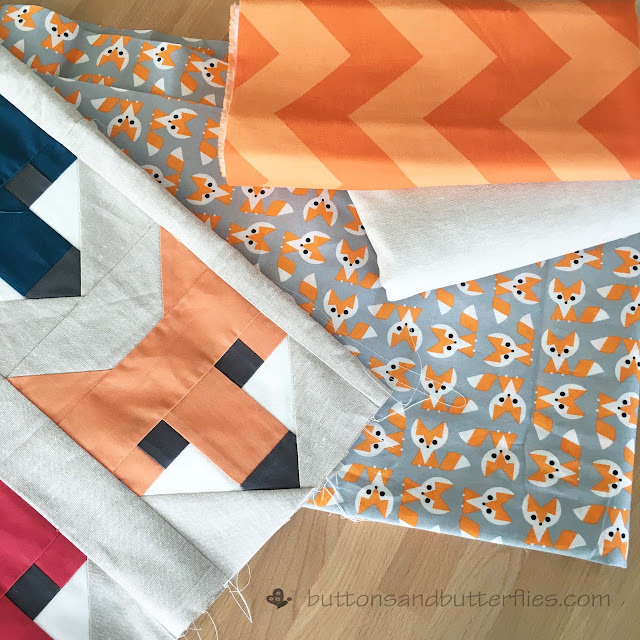 It's been lovely to read of Button's interest and involvement with his fox quilt. That's so adorable that he was so involved in the creative process. This will be an amazing family memory.